We offer beginners and intermediate lessons, as evening classes and full day courses. This course is intended to introduce you to the wonderful and amazing properties of molten glass. This takes place at Martin’s workshop at The Ruskin Glass Centre in Stourbridge. He has been providing glassblowing lessons for over 10 years, in addition to making his own work. Martin aims to provide an individualised teaching for each student. The emphasis on the class will be to provide you with hands on experience. You will cover the basics of hot glass making within the workshop including: gathering, shaping and forming the glass at 1050 degrees centigrade. Learning to develop hand eye co-ordination and rhythm to turn, stretch and control the molten glass. You will start making solid forms and paperweights, before progressing to blowing the glass to create bowls, vases and other forms. Through demonstrations and close supervision, you will quickly gain a basic understanding of the molten glass and gain confidence in being able to manipulate this amazing syrupy material. Working in a small team of usually no more than four people, you will set out to discover different approaches to working with the hot glass. You will explore form, texture, colour and pattern to create a series of solid and blown items. You will learn about the movement, timing and communication needed by the glassmaker to create original and inspiring pieces. This one-day class, or series of classes will allow you to develop your own ideas through discussion, research, drawing and making. The class will be divided between demonstrations, supervised work time and idea development. The emphasis will be on individual attention for each student to enable you to play, investigate and realise your ideas. Naturally you get to keep your artistic creations. You will find this to be a unique and enjoyable experience and will want to explore it further. We are happy to teach individuals with any level of experience and complete beginners. Classes are normally limited to four people. As a special present Gift vouchers are available. Only 4 students are taught at any one time, therefore instruction is intensive and by all accounts most enjoyable! The cost includes tuition, materials and use of tools. Payment is required with booking. We can also cater for corporate and group bookings. We also offer intermediate lessons for more experienced students. 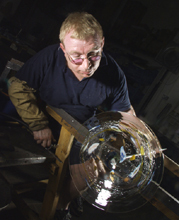 For professional glassmakers we offer studio hire and glassmaking facilities. Please enquire. Should the need to cancel a lesson arise, we need 48 hours notice, due to the preparation involved.